A collection of letters from our August edition. I was really heartbroken to read the letters in the June issue discussing Peter Kinderman’s new position as a BPS President and some of the comments he has recently made. Aurora Dunn questioned where the boundaries lie around psychologists’ role in social issues and policy. As correctly articulated context underpins everything we do as psychologists, it seems nonsensical to ignore it for fear of unfortunate consequences or misuse in the future. I find it difficult to see how targeting inequality and creating a fairer society could be detrimental at any point in time, in light of recent research into inequality’s correlation with people’s distress (Pickett & Wilkinson, 2010). Psychologists have moral accountability and a unique understanding of the role of reflexivity, and are therefore in a position to help people not just on an idiosyncratic level. David Harper’s article (‘Beyond individual therapy’, June, 2016) was inspiring, and as a trainee clinical psychologist I find the BPS’s coverage and support of such a movement is helping to keep me engaged during a time of disillusionment and frustration about many psychologists’ fear of questioning the status quo. Mike Davis’s letter refers to this movement as ‘creep’, and this is a creep I very much intend to be part of. I am not part of the ‘opinionated elite’ to which he refers. At the DCP Pre-Qualification Group Conference in March, the future of the profession were encouraged by Dr Masuma Rahim to be the ‘the grit in the oyster’, and Ella Rhodes, reporting the event for The Psychologist (May 216), described ’a hint of revolution in the air’. I don’t think this is a movement that can or will be stopped. I am also keen to see the development of the Political Psychology Section in an attempt to bring psychology into the real world, which I think Professor Kinderman is well and truly grounded within. I would like to take the opportunity to thank the BPS for covering such views and supporting those who hold them. Pickett, K. & Wilkinson, R. (2010). The spirit level: Why equality is better for everyone. Harmondsworth: Penguin. I am Director of the Division of Clinical Psychology’s Professional Standards Unit, Editor of Clinical Psychology Forum, and a Clinical Tutor with the Lancaster DClinPsy programme. However, I write to you not in any of these official roles, but simply as a person who was deeply saddened to see The Psychologist publish a letter in June’s issue that included the line ‘the lunatics have taken over the asylum’. Sometimes people write letters quickly without thinking through the full impact of their words. Therefore it is the responsibility of the publication to ensure comments are respectful and any offensive language is removed. One can express a point without needing to resort to ridicule and offence. In my mind, it is irrelevant whom this was written about. What is important is how we speak about people and the context of mental health. The British Psychological Society has a responsibility not to perpetuate stigmatising language and attitudes. If we make space for language like that in the publication of our professional body, what do we perpetuate in the streets and therapy settings? In the contributions section of The Psychologist website, you claim ‘The Psychologist is all about diversity’. It is good to be inclusive and make space for diverse views; this isn’t diversity though, it is offensive name-calling and stigmatising descriptions. In a time when The Psychologist is looking to increase access to the publication, I am inclined to ask how this would be explained to those of us who have lived through psychiatric systems, been called names associated with mental health problems, and then had our viewpoint dismissed on the grounds that we are ‘lunatics taking over the asylum’. The first two letters published under the heading ‘New Society President stirs debate’ (June 2016) leave me wondering whether this journal exercises any editorial standards. Aurora Dunn’s letter does not seem to leave the journal (or indeed the Society) with much of a role anyway as it seems to be arguing for the inability of psychology to support any position; then there is Mike Davies’s letter with its immoderate talk of impeachment and lunatics taking over the asylum. If anything threatens to bring the Society into disrepute, it is publishing correspondence of this abysmal quality. The question of whether mental illnesses are ‘real’ has seen an enormous amount of ink spilled, effort expended and – regrettably – vitriol spewed. But the question is ill-formed and the argument fruitless; in fact, the issue at stake is what it means, socially and culturally, to describe a person as having an ‘illness’. Plainly, at times many people have experiences that they (and/or sometimes others) find deeply distressing and that are statistically unusual, in the sense that they fall outside the range regarded as ‘normal’ for a given situation. No one seriously doubts that these experiences are: (1) real; and (2) worthy of others’ attention, empathy and support. The question is: Are they best described using the concept of ‘illness’, with the connotations this carries? Some, presumably such as British Psychological Society President Professor Kinderman, would argue that they are not. Others, presumably such as your correspondent Mike Davies (Letters, June 2016), would argue the contrary. This is complex debate, over which rational and reasonable people can disagree. It is vital to realise, however, that the debate is not about ontology but about the ways in which different discourses delineate and constrain possibilities for action in the social world. It is unhelpful to characterise it as an argument about scientific truth, and more unhelpful still to characterise those sceptical of the utility of the ‘illness’ discourse as denying the existence of human suffering. As the Society’s previous President, I feel that it is my duty to write on the subject of psychology and politics. All British Psychological Society members are bound by our Royal Charter, which we have now held for over half a century, the Objects of which begin: ‘to promote the advancement and diffusion of a knowledge of psychology pure and applied…’. 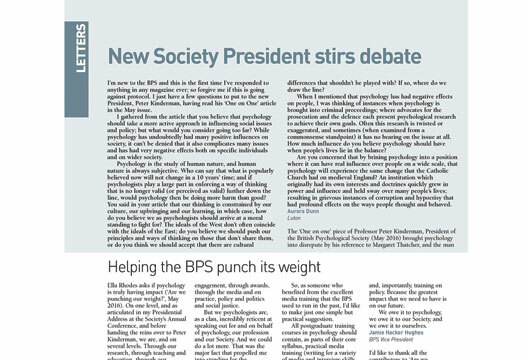 As ‘large S’ Society psychologists, therefore, we are duty bound to diffuse our advancing psychological knowledge wherever most appropriate to our ‘small s’ society, and this is what I spoke about in my Presidential Address at this year’s conference [https://thepsychologist.bps.org.uk/twelve-ways-make-impact]. Never has there been a more apposite or urgent time to do so, using our research-based knowledge and expertise on decision making, groupthink, leadership, change, loss, bereavement, trauma, survival, positive psychology and hope. I would urge you all to join your President Peter Kinderman, President Elect Nicola Gage and me in doing so.